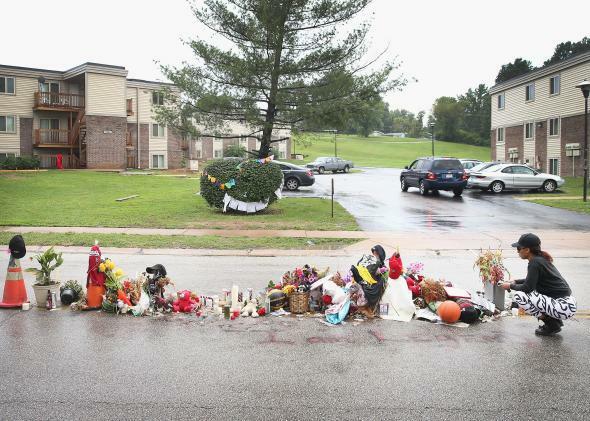 Darren Wilson says Michael Brown pinned him down in his car. Tamika Staton leaves a personal message last month at a memorial in the middle of the road where teenager Michael Brown died after being shot by Ferguson police officer Darren Wilson on Aug. 9. The federal investigation into the shooting of Michael Brown in Ferguson, Missouri that took place two months ago and sparked a nationwide debate about the militarization of the police is continuing. But so far at least, there doesn’t appear to be enough evidence to file civil rights charges against the shooter, Officer Darren Wilson, who has told investigators he feared for his life while Brown pinned him in his vehicle during a struggle over his gun, reports the New York Times in the first public account of the officer’s testimony. Wilson’s gun was fired twice inside the car, and one of the bullets struck Brown in the arm while the other did not hit anyone. Wilson’s September testimony contradicts some witnesses, but the forensics tests did show Brown’s blood was on the officer’s gun and on the interior side of the car door. Brown reportedly scratched and punched Wilson repeatedly during the scuffle, according to the officer’s testimony. His version of events could be crucial to the grand jury because Wilson’s “feeling of vulnerability and his sense of heightened alert” could help determine whether the officer was justified in using lethal force.